This Bulls team for 2013-14 sure looked good on paper. Though now we’re starting to wonder if we were writing with invisible ink. “It’s frustrating,” admitted Derrick Rose Wednesday after the Bulls collapsed down the stretch once again and lost 97-80 to the Indiana Pacers, who closed the game with a 30-11 run in the last seven minutes. “But we’re pro athletes. It’s just four games in. We can’t let it get that frustrating. We know if we keep working hard like we’re doing we’re going to catch a rhythm soon. Luol Deng scored 17 points, but the Bulls couldn’t hold off the Indiana Pacers, who closed the game with a 30-11 run in the last seven minutes. 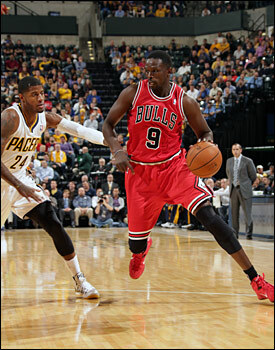 Panic didn’t seem to be settling in among Bulls players afterward even as they fell to 1-3 while the Pacers went to 5-0. Though perhaps that’s not so great. Not so much that a week into the season is time enough to make judgments. But perhaps a bit more passion is necessary. The Bulls continue to play hard; but they also seem to play without the vehemence and animation so prevalent in recent seasons. Lest the beautiful view the Bulls figured to be looking at this season turns out to be the scene tumbling down the mountain. Take a quick look when you’re falling. Because you may never see anything like that again. The Bulls 1-3 start is the worst since Tom Thibodeau became coach in 2010 and the most games, albeit such an early stage of the season, the Bulls have been under .500 with Thibodeau as coach. The Bulls host the winless Utah Jazz Friday. It’s also the poorest start for a Bulls team since 2007-08 when coach Scott Skiles was fired in December, certainly a fate that will not be considered regarding the highly regarded Thibodeau. But there’s some fixing to do as the Bulls were uncharacteristically dominated on the boards, 52-40, and 17-11 on the offensive boards. The Pacers had an 18-4 edge in fast break points and 28-14 in points in the paint. Which told the story of the game. The box score doesn’t always as Rose and Luol Deng led the Bulls with 17 points each while Paul George had 21 for the Pacers and David West had 17 points and 13 rebounds. But supposedly as an inside/outside team, the Bulls rarely got the ball into the paint or to Carlos Boozer in the post. 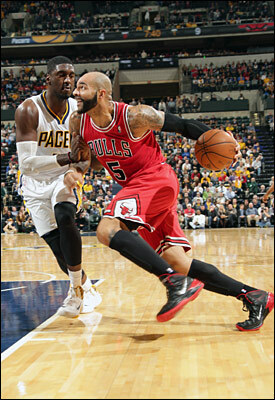 Boozer had six points and nine rebounds, but few post touches. The Bulls also talk about pushing the ball, especially now since Rose is back. But they had just two transition baskets and spent way too much time running half court offense, which allowed the Pacers to throw multiple defenses, traps and bigger defenders at Rose. But once again Rose made numerous passes that either turned into missed open shots or were fumbled or missed at even point blank range. Deng continued his three-point shooting ineffectiveness with three more misses and is now one of 15 on the season. He was six of 18 overall. Boozer was three of 10 and Jimmy Butler two of six. Noah missed both his field goal attempts, leaving the starters other than Rose 11 for 36. Kirk Hinrich played a strong game in reserve with 12 points and five assists, and played considerably more in the second half than Rose. Likewise, Noah played only about 11 minutes after halftime when the Bulls led 43-37. The Bulls trailed just 63-62 going into the fourth quarter and were leading 67-65 with 8:37 remaining in the game. And then like in leading the Knicks by 10 in the fourth quarter and needing Rose to bail out their only win of the season and blowing a 20-point lead against the 76ers, the Bulls were overrun in the fourth quarter. What’s worse perhaps was the stakes. Not quite a defining moment yet, but if the Bulls want to catch Miami they need to win their division first. But the Pacers continued to be the league’s best defensive and rebounding team, holding the Bulls to 35.6 percent shooting with league leader Roy Hibbert blocking five more shots and pulling away in the fourth quarter with a more physical effort, 17-6 on the boards in the final 12 minutes. The Pacers really have been good students because they seem to have taken the Bulls formula and are applying it themselves successfully. They’re not a high powered offensive team, basically with one star, the fast developing George. But they have the interior size and rebounding, the defense and the second unit, which came in with Luis Scola combining with an animated and emotional Lance Stephenson to score 20 fourth quarter points, more than the entire Bulls team. The duo combined for 13 straight points in about a two and a half minute stretch that enabled the Pacers to break from a 67-67 tie with 7:34 left to lead 80-72 with 4:25 remaining. Then West inexcusably grabbed an offensive rebound on a missed Stephenson free throw and passed to former Bull C.J. Watson for a three pointer in a play that symbolized the night, the Pacers opportunistic and tougher on the boards and making the big plays and big shots. Watson’s three made it 83-72 with 4:18 left. He was starting for the injured George Hill, thus further enhancing their strong bench when Hill returns later this week. Hinrich was fouled on a pull up jumper, making one of two. The Pacers made a curious eight-second backcourt violation. But Hibbert blocked a short Boozer shot, leading to a runout fast break from Stephenson, who stood and preened to the roaring home crowd as Bulls players on the bench sat silently. Hinrich responded with a three pointer to give the Bulls faint hope with 3:30 left. Hinrich then was called for a flagrant foul against Stephenson with an elbow, an apparent retaliation from a previous physical encounter. Stephenson, who scored all his 15 points in the second half, missed and Rose drove hard and was fouled, making both free throws and giving the Bulls a chance trailing 86-78 with 3:07 left. But it was a mirage as West stepped back for a 20 footer, Rose was trapped with a double team and lost the ball to West, George took off and was fouled, converting both before a Rose missed three. George then got matched up against Rose on a switch and took him to the basket. Noah moved over to help and committed a hard foul and landed hard on his back. George made two more free throws for a 92-78 Pacers lead with 2:04 remaining and then after Hinrich lost the ball, Stephenson slammed on a fast break to make it 94-78 with 1:51 left and pulling away. Within a few seconds, Thibodeau would put in his deep bench reserves for the first time. And, interestingly, Rose and Noah didn’t play so much for the Bulls. Of course, the irony is so many are always saying Bulls starters play too much. But they haven’t the start of this season, and Rose and Noah both played just over 27 minutes and sat long stretches of the second half before coming back into the game in the last five minutes. Thibodeau said the starters were losing leads after being ahead 9-4 to open the game and then 51-49 in the third quarter before the Pacers went on a 14-4 run. So Thibodeau went without Rose from 4:55 left in the third and the Bulls trailing 56-51 to 6:16 left in the game and the Bulls trailing 72-69. Noah went out when Rose did with 4:55 left in the third and came back in the fourth with 5:24 remaining. “The bench I thought played well,” said Thibodeau. “I thought Hinrich was terrific. Mike Dunleavy is starting to get into rhythm. They got us out of the hole. 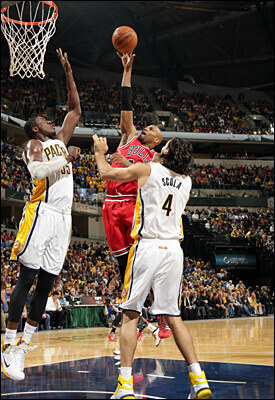 Taj (Gibson with nine points and six rebounds) was very, very good. I thought Nazr (Mohammed, as the reserves with Deng opened the second quarter with a 14-2 Bulls run) gave us some real good minutes in the first half. They did a good job. But it’s a Bulls team that seems more shocked than anything. They truly believed with Rose’s return they were ready to become elite. And perhaps they will. They were 2-3 in Thibodeau’s first season and won 62 games. But this also is the first time this group is facing big expectations, much of which they’ve put on themselves. They’ve never been the type of group that goes into games to turn it on when needed. Though they have played three good quarters in basically all their games. Perhaps that Thibodeau cliché about 48 minutes is appropriate. “Sick of losing,” said Noah, speaking in short bursts. “It’s everybody; everybody’s got to come in with the right mind set. They took it from us in the fourth. It’s all about winning and losing; right now it’s all losing. Defensively, second shots, turnovers. They were on the fight and we weren’t there. “I wish I had more answers,” said Noah. “I don’t know what the answers are. We’ve got to get our groove as a unit, as a group. It’s going to come. Still, many of the same issues exist. If players don’t shoot well, the defenses will continue to double team and trap Rose, making driving and scoring more difficult for him and everyone else. And the less the Bulls get in transition or even spreading the court to give Rose space, the more contained and constrained Rose is. Butler and Noah remain hesitant with their shots and the reserves don’t have an offensive creator. But then the defense isn’t closing and contesting as it has, which enabled the Pacers to make six of 11 second half threes as they pulled away thanks to the big shots and crucial rebounds, the ones the Bulls would get. And so the work continues. Frustrated? Thibodeau was asked about the players. Because you don’t want it getting late when it’s early.